…And, that was the point when the Thai southpaw uncorked a monstrous right hook that connected flush against Barro’s chin, causing the Filipino to plummet face first into the canvas. A few years later, an even more celebrated Nak Thai practitioner named Samart Payakaroon made his professional boxing debut at against former WBC 108lb titleholder Netrnoi Sor Vorasingh, and outpointed him over the ten round distance To be fair, it should be noted that Samart stood almost a foot taller than his diminutive 4’10” rival and that the two were fighting several divisions north of Netrnoi’s best weight. Still, the fact that in his first bout, the former kick-boxer was able to successfully navigate a distance that was twice as long as any Muy Thai contest he’d been involved in isn’t something to be dismissed. The fact that it occurred against a fighter who had been successful at world level makes the achievement even more noteworthy. So, as we approach the hour when a notable participant in a different combat sport makes his own high profile debut as a boxer, it should be noted that there have indeed been instances when certain individuals have been able to transition quickly and immediately defeat high level opponents right from the start. Doing something like this isn’t without precedent. I can’t finish writing this sentence. At least, not while being able to keep a straight face. Just for a moment, let’s ignore the fact that Muy Thai likely serves as a more appropriate gateway into the sport of boxing than mixed martial arts, if only for the fact that it places greater emphasis upon striking from a standing position. Let’s also ignore the fact that Samart and Saensak were both incredibly gifted fighters in their own way. Payakaroon’s defensive reflexes had already earned him the status of “Muy Thai’s Muhammad Ali”, while Muangsaurin was already renowned for his power and durability going into his professional debut. Let’s focus instead upon the fact upon the opponent that the UFC champion will be facing in the ring tonight. Floyd Mayweather Jr. is 40 years old, coming off almost a two year layoff, and about a decade removed from his absolute peak as a fighter. He’s also 49-0, a former lineal champion in four different weight classes, and in possession of a catalog of offensive and defensive techniques that’s as extensive as any of the great ring general to ever stepped in the ring. Mayweather knows numerous ways to feint down an opponent’s guard and pot-shot from the outside; and just as many ways to manipulate and roughhouse them in close. The Devil, as they say, is the details- and time and again Floyd has proved that his attention to detail is immaculate. Conor McGregor has the advantages of being younger, taller,and larger than his opponent; and he’s got a left hand that has wreaked havoc upon the opponents he’s faced inside the Octogon. But, I suspect that he’ll find it difficult to land that left hand properly against one of the premier defensive specialists in the sport’s history, or to use his size effectively against someone who has forgotten more about the sport than he could ever hope to learn from this point forward. 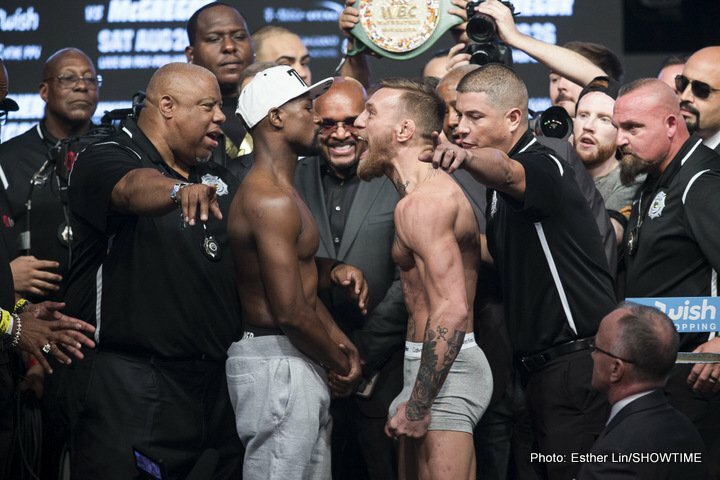 I suspect that once Mayweather takes a round or two to figure out exactly what, if anything, his opponent might bring to the table and perhaps another couple to fully shed any lingering ring rust, he’ll take control of the contest and his opponent. Once the happens, this spectacle will seem less like a competition, and more like a cruel child gradually pulling the wings off a captured butterfly. At that point, it will simply be matter whether or not Mayweather chooses to tear those wings off completely, and when it might occur if he decided to make that happen. Personally, I think Mayweather probably does decide to finish the man who has fired so many verbal missiles in his direction; likely in the championship rounds in order to exhaust him and to provide him with opportunity to fully instruct him on all the nuances of his chosen craft. And, in the process, he’ll also ensure that Samart Payakaroon and Saensak Maungsaurin remain the benchmark for making successful transitions to the sport of boxing against higher level opponents. Author’s Pick: Mayweather by corner stoppage at the end of round 10. In a way, it’s fitting that Mayweather-McGregor occurs on the same night that a former Mayweather opponent, Miguel Cotto, makes his return to action at the StubHub Center in Carson, CA after almost two years away from the ring. After all, the Puerto Rican superstar has spent pretty much his entire career toiling in Mayweather’s shadow. Why should this day be different from any of the others that preceded it? Still, Cotto’s return is worthy of note, if only for the fact that it provides us with the opportunity to watch a well known and well-schooled former champion compete for the vacant WBO 154lb title against an ultra-aggressive and much larger opponent. Some members of this site believe that this opponent, Japan’s Yoshihiro Kamegai, is capable of defeating the technically superior Cotto, and that he’ll be able to use his size and strength advantage to overpower Cotto and overwhelm in the manner that Antonio Margarito in their first fight. But, those people fail to take into consideration the fact that Cotto had more success holding his ground against the Mexican in the rematch, when the two fought at a higher weight. Moreover, they fail to take into account the fact that Kamegai has consistently faltered when he’s gone up in class, losing clear decisions to Robert Guerrero, Johan Perez, and to former Cotto victim Alfonso Gomez. Kamegai does hold a nice victory over the capable Jose Soto Karass, but there’s a quantum leap in talent from the challenge presented by a faded contender, and that of multi-division world titleholder- even one coming off an extended layoff. Miguel Cotto may not have the firepower that he once had, but unless he’s completely shot, he probably has retained enough precision and accuracy to fill the gaping holes apparent in Kamegai’s defense, and to do so as often as required to gain victory when all is said and done. He may not have guns needed to drop Kamegai to the canvas for good, but I suspect that he still has more than enough to shoot down any challenge that his opponent has to offer. In doing so, he’ll have put himself into position to land one final big fight before he ends his career, and reminded us of why it’s not always wise to discount a skillful, well-schooled boxer even if the autumn of his career. I just wonder how many people will be a position to listen to Cotto’s statement, given the statement that Mayweather will be making at roughly the same time.